Today I gained another 1,7% after selling an investment that I did held only a few days. I started using the Spanish property platform Housers in the beginning of August. 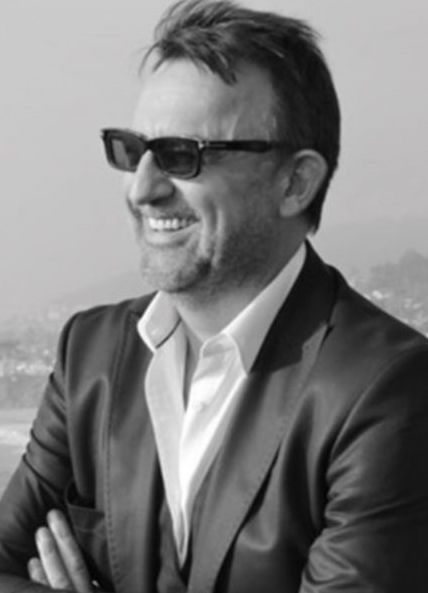 On Housers investments into property in Spain and Italy are listed. Mostly the offered structure is that investors will benefit from rent income from the property and also capital gains achieved, if the property is sold at a higher price at the end of the investment period. The concept will sound familiar to those that are using the British platfrom Property Partner. But there are other offer types too, including fixed interest investments. The minimum investment is 50 Euro and terms range from 12 months to 5 years and longer. There is a lot of information and statistical data about the properties and the property market in that town and neighborhood. The platform is easy to use. After signup, the investor needs to upload scans to verify identity and to connect a bank account. Deposits can be by bank transfer or credit card. I made a small withdrawal of 0.50 Euro via SEPA transfer to test withdrawal and the money arrived after 2 days in my bank account. 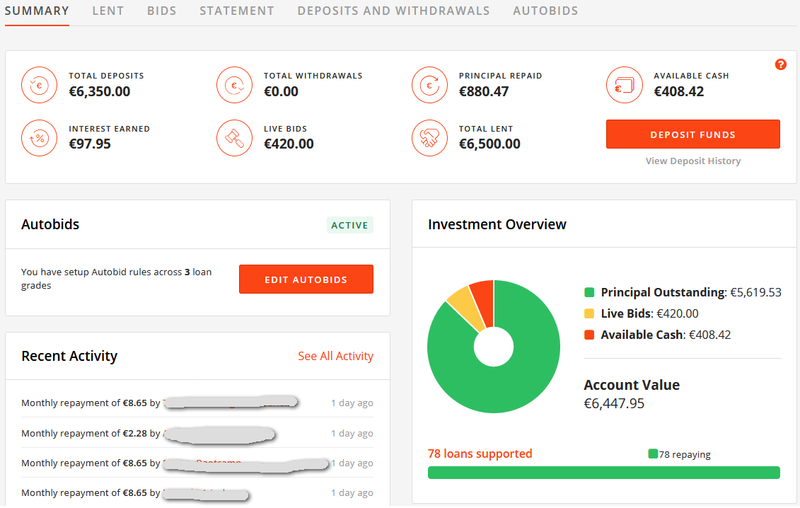 Current bonus: Sign up via this link and get 50 Euro bonus when you invest 50 Euro. Ends today (August 31st)! The bonus can only be invested, not withdrawn. Additional cashback of 1% on all credit card investments (you see that after you select a property to invest into. Ends today (August 31st). Housers has a secondary market. 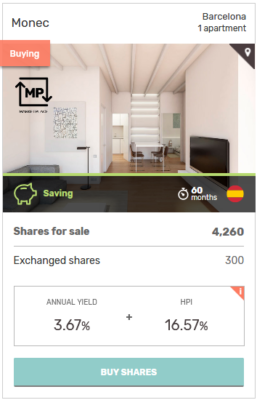 Only properties in the “Saving” category can be traded – with the “MP” logo style mark. Sellers can set a premium (or) a discount. When I started in the beginning of August I had 50 Euro invested in the Monec property (pictured right) and wanted to try out selling. So I listed that at 1.74% premium and was astonished that it sold quickly. I had exited that investment only 8 days after making the bid. Granted the absolute profit was not spectacular: 78 Cents (50.87 Euro sales price minus 0.09 Euro sales fee – Housers charges 10% of profits), but it was 1.56% profit in 8 days. Mathematically that is an (X)IRR of 102%, but of course one can not calculate it that way as a reinvestment without breaks will not be possible and not every time a buyer will snap the part that quickly. Nevertheless I got curious, if I could scale that somewhat and employ a strategy of flipping, that is investing and then selling fast at a premium. I invested in more parts of an Italian property opportunity (“Breda” in Milan). Yesterday the secondary market for this opportunity opened, and today I sold the first 100 Euro part for a 1.89% premium. I have listed the next 100 Euro part for 1.99% premium now. I have yet to experience a time where there are no offers on the Housers primary market. It will be interesting to see how that effects demand on the secondary market. The majority of investors is from Spain, but Housers says there is large demand from investors from Latin America, too. I like the platform interface, it is easy to use. The UI is available in Spanish, English and Italian language. Another property investment platform in the Eurozone offering a bonus is Estateguru. If you register via this link, you get 0.5% cashback on all investments in the first 90 days. Investments on Estateguru are into secured loans, not equity. UK p2p lending Marketplace Funding Circle announced today that from September 18th, there will be an important change to how investors can invest on the marketplace. From that date Funding Circle will withdraw the option to manually choose which businesses to lend to and which loan parts to sell. Instead Funding Circle says it will launch a significantly improved and upgraded version of existing Autobid and Autosell lending tools. Investors will be able to choose one of two new lending options based on their personal preference. Both options will be available as a Funding Circle ISA, which Funding Circle intends to launch later this tax year. Many investors do not currently benefit from lending to all types of businesses: currently some investors can find it difficult to access D and E loans, which are some of the most popular. We want to ensure investors lending through Funding Circle have an equal chance of accessing all loans, and earn the best possible return. It can mean your lending is not spread evenly across lots of businesses: currently many investors who manually choose loans are not fully diversified and are at risk of having a negative lending experience. We want to ensure investors spread their lending across lots of different businesses as this is the best way to earn a stable return. It can be confusing for investors: many investors tell us they prefer a simpler, easy-to-use lending experience: 73% of new investors who join Funding Circle choose Autobid, and 80% of Funding Circle investors* say simplicity of lending is important to them. Funding Circle will also make changes to the interest rates effective August 30th. Funding Circle says ‘When reviewing rates we take a number of factors into account, including macroeconomic trends, the expected mix of risk bands of borrowers, expected bad debt rates and wider competition in the market, which continues to be increasingly competitive for lower risk businesses. The new rates will allow you to continue to lend to established, creditworthy small businesses while earning an attractive, stable return.’. 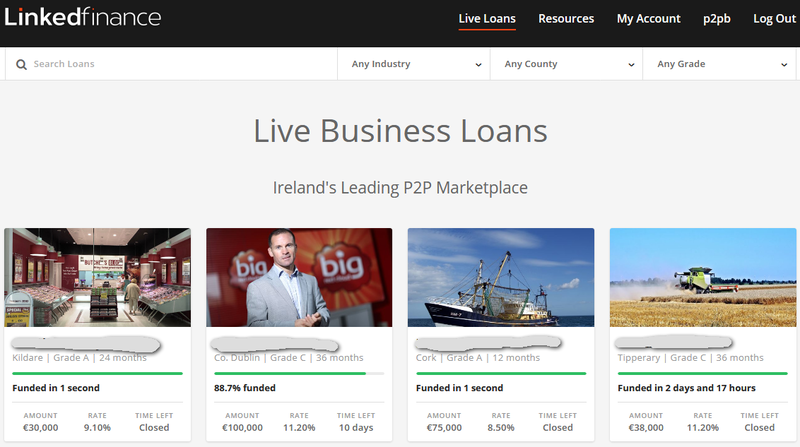 Furthermore Funding Circle has removes sales fees for selling loans, effective today. There will be no more premiums and discounts possible on the secondary market. 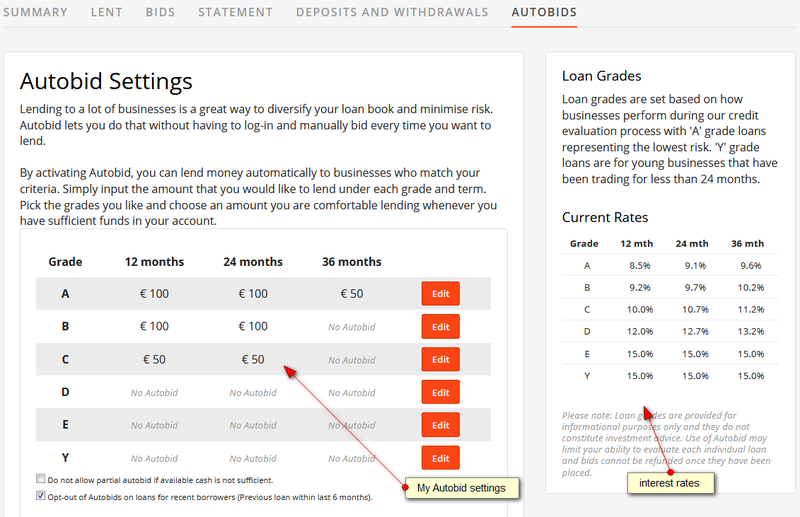 Several p2p lending services have made similar moves discontinuing self-selection of loans to invest into and asking investors to use autoinvest options instead usually citing simplicity and ease of use. While this may be true for part of investors it certainly is not true for all of the investors. Especially among most active and vocal investors there are some that like to select loans manually and dislike if that choice is removed (Funding Circle says 73% of new investors use autobid). Possible as a result of sentiments like that Bondora reintroduced more selection options with their Portfoloio Pro feature, after removing them earlier. What is Huddle Capital about? Huddle Capital is a P2P lender specialising in high quality, high yielding business loans. In an already crowded space, Huddle is differentiating itself by it high quality origination and a focus on educating its lenders to help them make better decisions. Unlike many other Huddle Capital is backed by a parent company that has been lending its own money for a long time, which they will continue to lend though the Huddle platform – really putting our money where our mouth is! The parent company underwrites each deal, which means that all borrowers will 100% get funded through our platform. In addition, we offer investors instant returns – in other words, investors start earning as soon as they make a commitment to invest in a loan, regardless of how long it takes for a loan and get fully funded. The main advantage for lenders on Huddle is that we are owned and managed by Access Commercial Finance which is an FCA regulated, balance sheet lender. Our belief is that most fintech businesses in the marketplace are too much ‘tech’ and not enough ‘fin’ so we are looking to correct that balance on Huddle. There is no point having a fancy website & tech if the underlying loans are of poor quality and the collection process has holes in it. We are an existing finance business that has all the processes and knowledge in place already – we are simply bolting on the p2p tech to allow investors the opportunity to invest alongside us. We aim to provide higher returns compared with average returns in P2P market, by leveraging our loan management expertise. Naturally investors must balance risk versus reward. We believe in empowering investors to make educated investment decisions, especially in this new asset class. We educate and provide a platform for investors to network with each other. The main advantage to borrowers is getting speedy access to funding for strong business cases that have been unable to achieve satisfactory funding elsewhere. This could be due to slow processing timescales by more mainstream lenders, or the fact that the borrower can’t find a lender who like their particular case / asset class etc. At Huddle we share many of the same management team of Access Finance and therefore have a wealth of commercial business experience as owners as well as lenders, allowing us to understand borrowers needs better and quicker than most other lenders. As always, reward increases with perceived risk so individual lenders are free to choose the loans and risk profile that suits them. Currently we have loans that pay lenders from 8% to 16% per annum, depending on their risk appetite. Naturally, ROI increases with the ability of the platform to manage bad debts. Our parent, Access Commercial Finance, has only ever had minor default since they started lending. We deploy the same credit management team who is proactive in chasing down late payments. Why did Access Commercial Finance decide to start Huddle Capital? At Access we have been originating a stream of good quality loans for many years and have had great success funding them from our own balance sheet. But we don’t have unlimited funds and often come across loans which we would like to be involved with but they need pricing more competitively than we are able to. So with Huddle we are looking to open up our origination channel to P2P investors, allowing us to write more business and not have to pass up great opportunities just because our own funding capabilities don’t allow it. Huddle Capital is using technology supplied by Ablrate. What factors led to the choice of this solution and how satisfied are you with the software? At Access we have had a fantastic working relationship with Ablrate for the last couple of years. We have originated a lot of high quality loans that Ablrate have funded through their investor base. We actually looked at a lot of software providers in the market and were not 100% happy with any of them. Then we thought ‘hang on a minute! Why aren’t we working with Ablrate on this?!’. 10 weeks later we were live! David at Ablrate is a very good operator and very commercial to work with, so the process was a breeze. 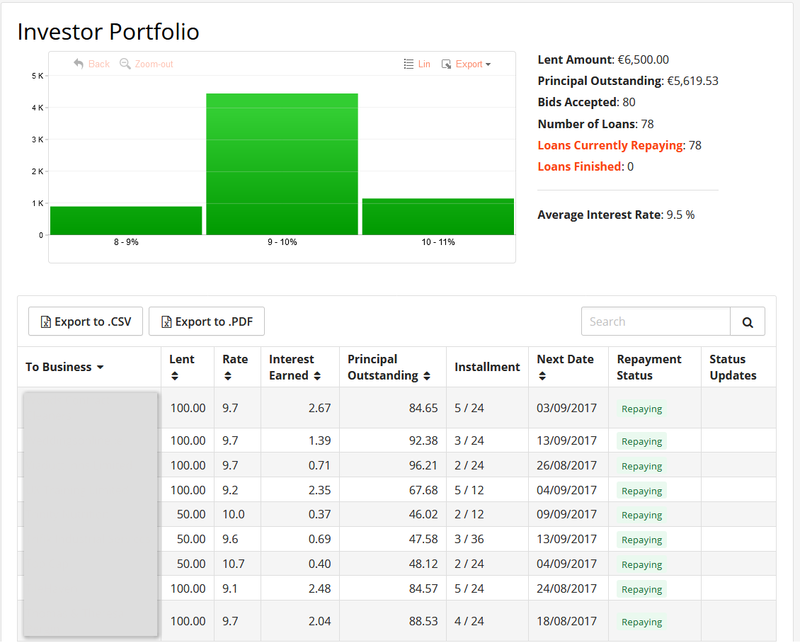 The Ablrate platform is proven – having gone through a stringent review by the FCA as part of the approval process. We leverage their practical experience to ensure that we avoid mistakes made by the pioneering P2P industry. Huddle Capital Limited is an Appointed Representative of Rebuildingsociety. What does that mean and why did you choose that structure? In simple terms this mean Rebuildingsociety provide us our regulatory permissions whilst we await our own from the FCA. Getting directly authorised from the FCA is a long and laborious process. Becoming an Appointed Representative allows us to get up and running in a matter of weeks as opposed to potentially well over a year. It makes no differences to our lenders or borrowers, we are still governed by the same rules as everyone else for their protection. We will look to get our own permissions in the fullness of time, but right now we are concentrating on building the business. What were the main challenges launching your platform in a competitive (crowded?) market? Once your tech works there are only 2 real challenges in this business – attracting lenders and finding borrowers. Fortunately we have got plenty of borrowers both existing and in the pipeline – so our challenge is getting out there in front of more lenders so they can learn about our platform and the benefits of lending through Huddle. Hopefully this interview will help with that! We had support from a progressive consultancy, Vedanvi, who helped us develop the strategy, build the business, operate it and then transfer it to our own internal team. They have significant experience in this market space and we leveraged their expertise to ensure a smooth and successful launch. Is Huddle Capital open to international investors? International investors are welcome to invest through Huddle Capital. As required by law, they have to undergo additional anti money laundering checks before they are allowed to invest on our platform. Investors need to realise though that their loan contracts and their contract with us are governed by UK law. Currently all our borrowers are generated via Access, our parent company. We have no shortage of quality businesses looking to borrow money! We are marketing to investors through the usual channels of PPC & SEO, but the primary channel we use is content led marketing, providing educational led content, empowering potential lenders to understand the lending business better and be in a position to make informed lending decision. Do you plan an IFISA product offer? Yes we certainly do but realistically it will be a few months down the line. We have lots of additions to the platform & the technology over the coming months and it is a matter of getting our priorities in order. We have launched, we have tech that works and now we are starting to get a flow of strong and high yielding loans. We are currently concentrating on brining on new investors so we can ensure strong liquidity in both the primary and secondary markets. Then we will move on to getting the IFISA launched. It’s keeping us busy! Where do you see Huddle Capital in 3 years? Hopefully as a highly recognised brand name in the P2P space. We should have a large base of happy lenders who come to us time and again to deploy their money in to high yielding, secure opportunities. Just doing more of what we do now, and listening to our lenders and borrowers to keep improving! P2P-Banking.com thanks Terry Fischer for the interview. Today Aegon and Funding Circle announced a strategic long term partnership. Aegon will invest in loans to UK small businesses originated through p2p lending marketplace Funding Circle. The partnership will see Aegon fund 160 million GBP of loans in the first 12 months under a framework agreement, with the intention to extend this step-by-step into a four year funding program. In the first year the investment will help approximately 2,600 UK businesses to access finance. Aegon joins a wide range of investors lending directly to small businesses through Funding Circle, including 65,000 individuals, local councils, the government-owned British Business Bank, the European Investment Bank and other financial institutions. Funding Circle states, investors in the UK have earned an average 6.6% per year and 135 million GBP of net interest over the last seven years.